The Rational Ape: The Ravages of Chinese "Medicine"
The Ravages of Chinese "Medicine"
I have been to Aquila and met these individual rhinos. Two of the three mutilated were so hacked-up that they didn't survive. And this was done for a substance the ingestion of which has the curative value of biting your fingernails. 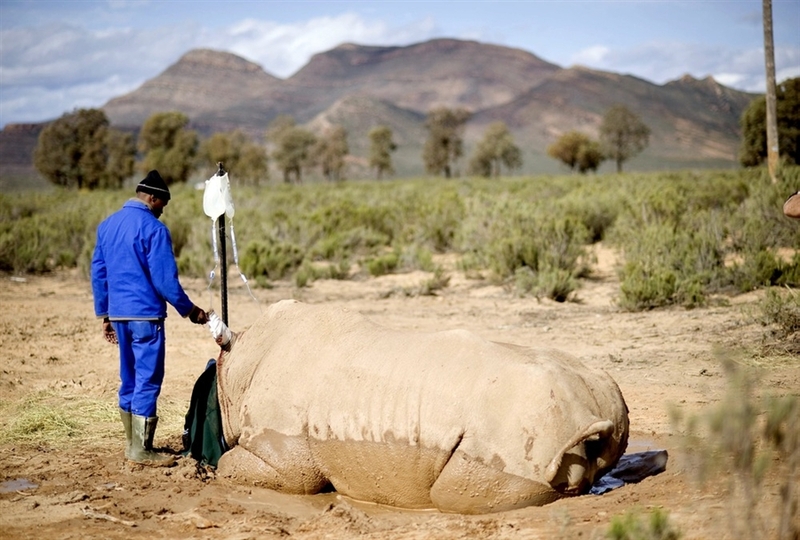 Poachers attacked three of the six rhino on the Aquila Game Reserve, killing one outright and injuring this one badly. This rhino bull was tranquilised by poachers, who then sawed off his primary horn, and began cutting the smaller one, but were apparently disturbed and left. The critically injured male is one of the latest victims in South Africa's rhino bloodbath, which is surging on privately owned reserves as criminal syndicates target easier prey for the Asian black market. Rhino horn is used in traditional Asian medicine to cure a range of ailments from fever to cancer, and sells for more than cocaine despite having no scientific medicinal value. After finding the second rhino, we sent all rangers and security staff in game vehicles, on quad bikes and horseback to search for the one rhino that had not been accounted for. Knowing that the poachers had used drugs that would kill the rhino instead of bullets that could be heard by anti poaching teams, time was of the essence and no expense was spared… two helicopters and a light aircraft from Cape Town were brought in to search Aquila’s 7500 hectare conservancy. The rhino was spotted from the air by the owner Searl Derman, from his friend, Enzo Kuun’s helicopter of Cape Town Helicopters. On landing they discovered a blood bath and a rhino with his face literally hatched off with pangas and machetes proving that there were two active teams attacking the Aquila rhinos, one using a chain saw, the other using pangas and machetes to dehorn the rhino. This is heart breaking and shows just how dangerous and destructive alternative medicine can be. Charlatans who peddle these patent medicines should be punished and the massive industries of homeopathic and bunk herbal remedies that by extension support and validate them, should be publicly discredited and tolerated by no one.